Hundreds of thousands of marine animals die each year due to man-made waste that is poorly disposed of into our oceans, rivers and waterways. This rubbish, often originating from overflowing waste disposal sites, build up in areas called gyres. These gyres are areas where water is shallow and wind is low. Just think of a coastline near you. Often a trip to the beach is ruined by the build up of rubbish that surrounds the coastline. Now named the ‘Garbage Patch’, there is a gyre in the Pacific Ocean, which spans the length of Texas. It is estimated that the amount of debris could double in the next 5 years. Watch the last series of ‘The Island with Bear Grylls’ on Channel 4? Even the remote islands in the Pacific, which hosted the stranded men and women, were littered with rubbish. Although the shipwrecked contestants used the rubbish to their advantage, for a turtle, plastic and other waste is a hazard. Why is plastic particularly dangerous? Well, the answer is that unlike biodegradable rubbish, plastic will not disappear. Turtles often swim into plastic, causing injury. Alternatively, they ingest it and this can cause eventual death. Only 5% of the world’s plastic bags are recycled. When you think about the sheer volume that is thrown away, it’s staggering and the damage is having a real impact on the number of turtles on our planet. At Oyster, animal conservation is important to us and this is why we support programmes that are making a genuine impact. We have a turtle conservation project in Costa Rica, where volunteers help to protect nesting turtles and their eggs to give them the best possible start in life. 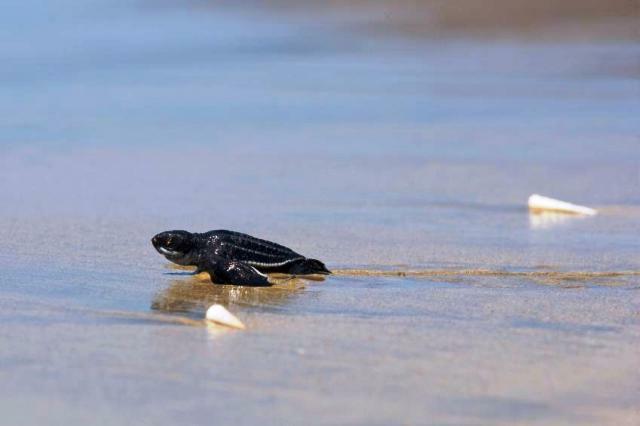 They help with beach clean-ups to ensure that the coastline is kept as safe as possible for the turtles. The only way to help the marine life, suffering because of man-made waste, is to spread the word and to get involved. Next time you throw away plastic, check if it can be recycled; small steps can make a big difference. Next Post Like animals? You will love this! Previous Post How can a gap year boost your CV?